In spring 2016, we are opening a new community space in Choja shopping street to create more community building opportunities. We rent a vacant shop space where previously was a farmer’s store Pumpkin, and utilize the place as a community space Choja Mart (tentative name). The space can be used as a shop or used for flea market, workshop, small starter business and more. Due to the lack of funds, we would like to create this space with you, users. For example we work together to outfit the interiors of the building. 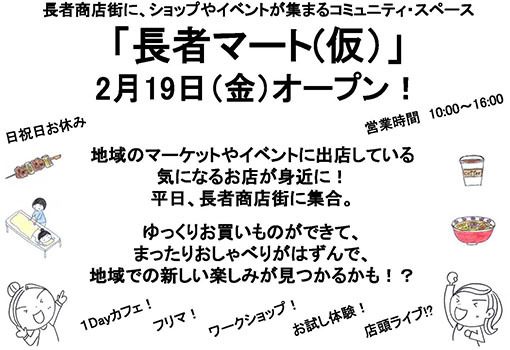 ○Details: We aim to create a community space where everyone (both Isumi citizen and people who visited Isumi for first time) can meet and enjoy. We are planning to sale farm products made in Isumi (sweets and deli made with local products); display and sale handmade products; offer opportunities for small starter business; hold flea market etc. Please feel free to contact us if you would like to use the space. We look forward to meeting you at Choja Mart. Toll Roads Free Campaign. 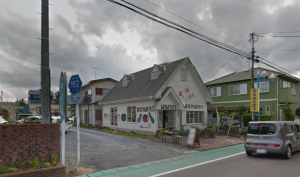 Come to visit Isumi for a summer vacation. During the summer tourist period (Jul.-Sep.), you can go for a drive to Isumi with low cost from Chiba area. Toll Roads that are managed by Chiba Road Public Corporation will be free all day for all vehicles. From Togane-shi to Ichinomiya-machi is the area related to Isumi. From Togane you go through Togane-kujukuri-yuryo-doro (Togane-kujukuri toll road) and Kujukuri-yuryo- doro (Kujukuri toll road) and reach Ichinomiya-machi, where is a contiguous city to Isumi. Why don’t you visit Isumi in the summer vacation? We are pleased to inform you that our new office of Isumi Lifestyle Laboratory was opened on June 13, 2015 (Sat). We have had a lot of support from many people to open this new office. We are very grateful for your kind support!! We felt one more time the importance of the relationship with people by today. We would like to continue to help people who are related to Isumi live vivaciously and freely. We will continue to take action lively at this new place. 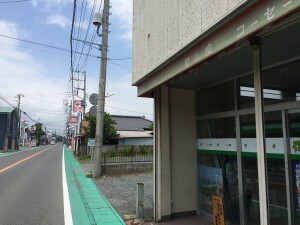 The office was relocated from Misaki city government office to now the shop building of middle of Misaki Choja shopping street. A flag of Isumi Lifestyle Laboratories will be a landmark. 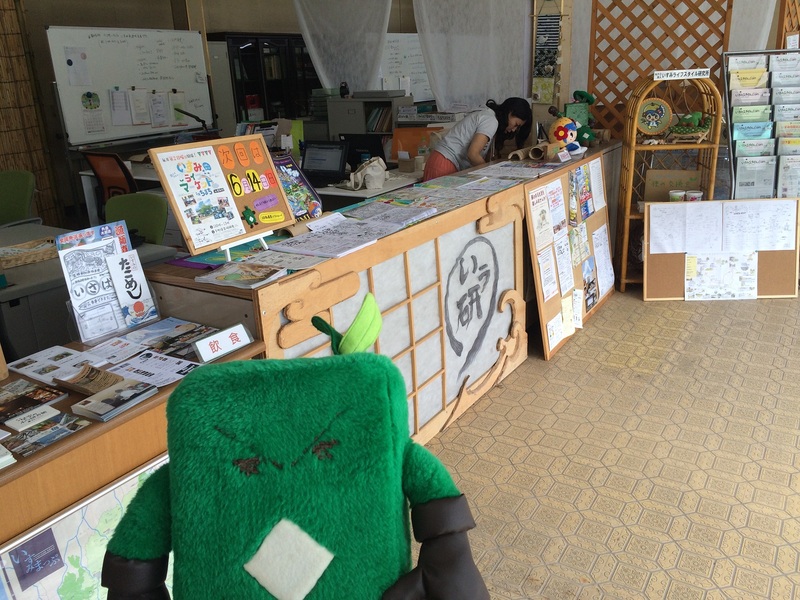 You will also find Makibe, our cute mascot character, at the window of our office. Morning market venue where it takes 3 minutes from the office is our car park. *The morning market will be held every month on 4, 14, 9, 19, 24, and 29 before noon. You can use the car park of the opposite side of the market at the time. Why don’ t you stop at morning market as well? Recommended information from our website staff *Chojamachi morning market information*. You can take time to collect information. 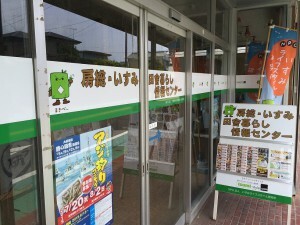 Since our office is now in the shopping street, we will try to make our office as a place where you can pop in anytime. Even today local students and neighbors visited our office. We are happy that we can meet new people. *No change for TEL, FAX and E-mail. We are closed on Sunday, Monday, and Tuesday.